Soccer fun with Mr. Billy coaching our K-5 students! Would your student like a fun afterschool cooking class? 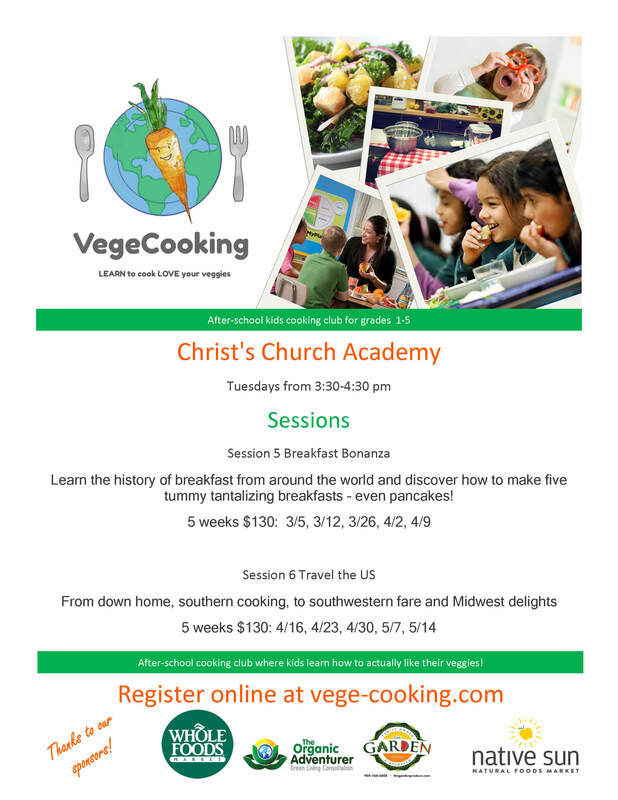 This VegeCooking class will teach them all about cooking healthy recipes from around the world in an encouraging and interactive atmosphere. 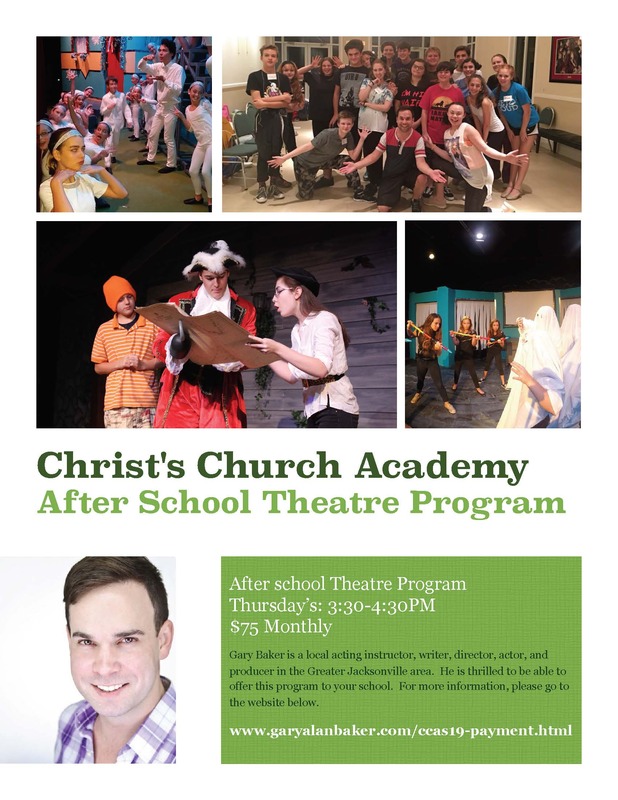 Come and be a part of after school Theater at CCA! Permission Slips can be found below. 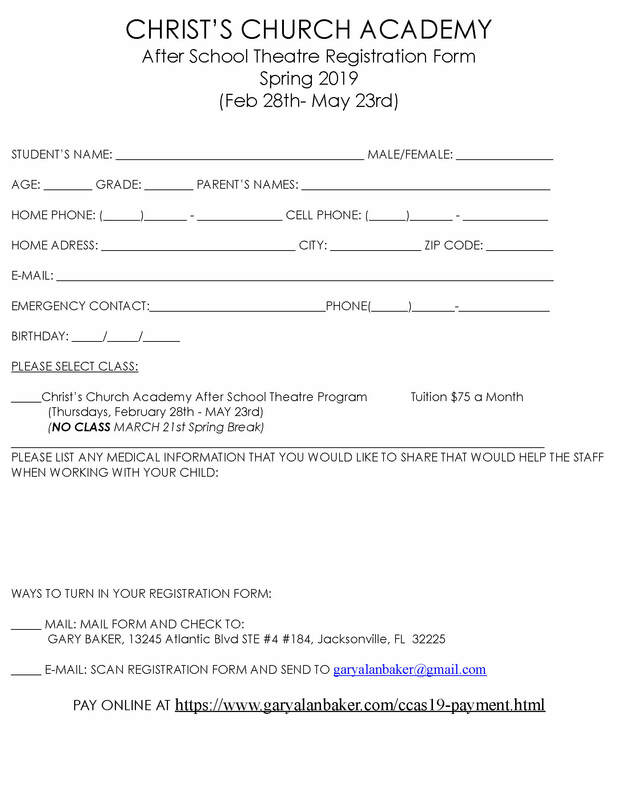 Please Fill out this permission slip & the below Liability Waiver in order to participate in CCA Theater After School Activities. 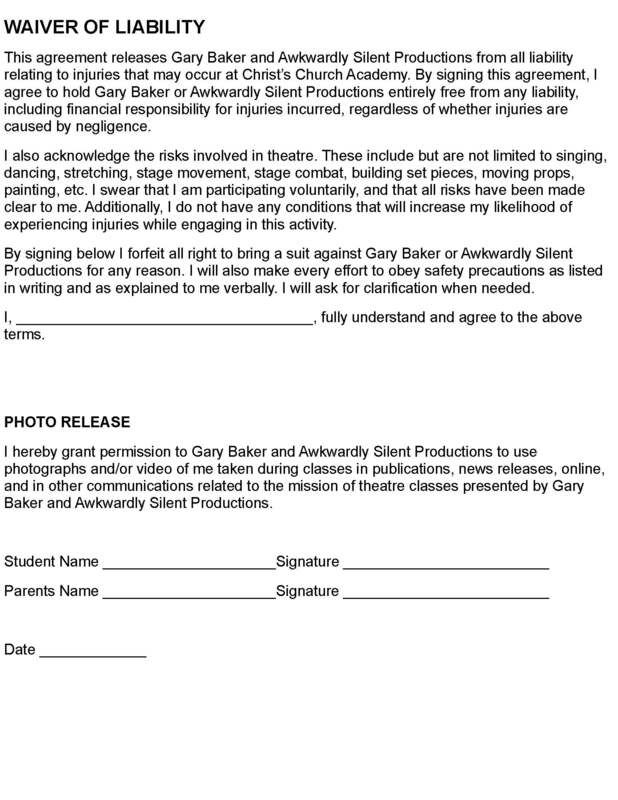 Please fill out this Liability Waiver and the Permission Slip above in order to participate in CCA Theater After School Activities. 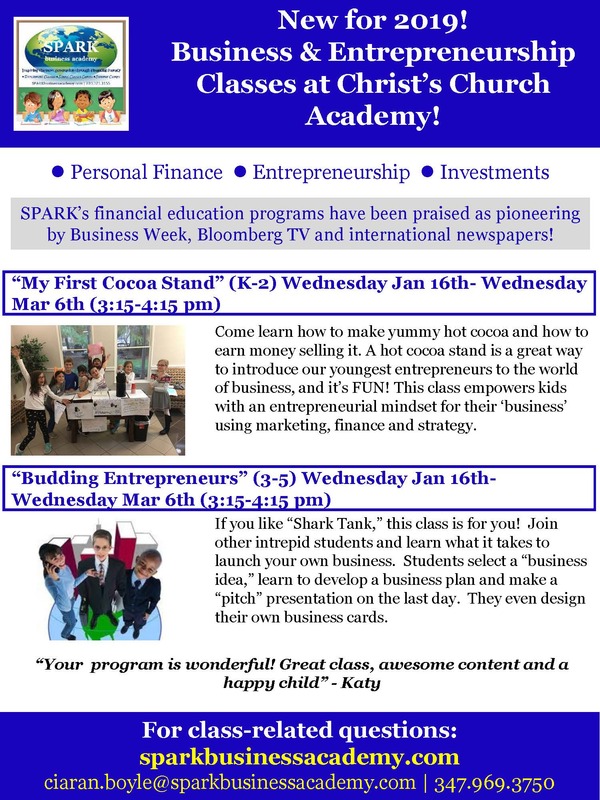 Learn all about business and entreneurship in this exciting after school activity! 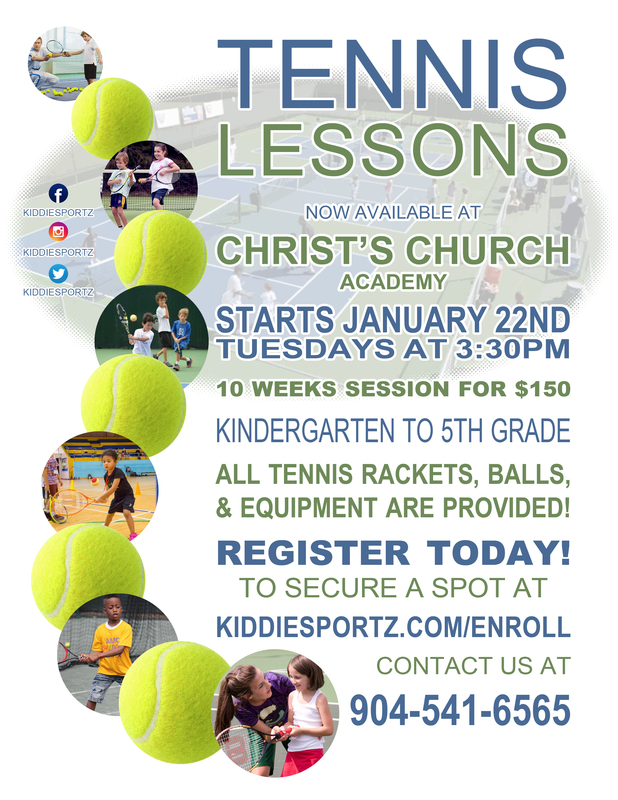 Learn how to play tennis in this after school activity! 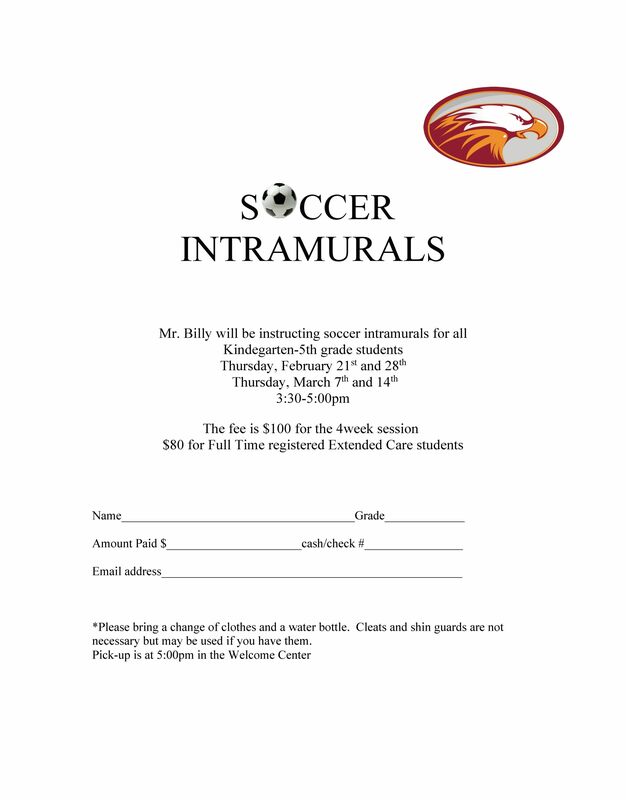 Turn in this form in order to partcipate in CCA's after school flag football activity! Learning spanish is fun and in this after school class students will learn spanish thru lots of exciting activities! Print out the form, fill out, and return to Joann in extended care in order to participate. Download and print this form to fill out and turn in to Joann for participation in CCA's Extended Care program. We are staying busy and having fun in our Extended Care and After School Activities programs. Find forms and information here for everything you need concerning Extended Care and After School programs like Spanish, Art, Music, Flag Football, Chess and more! Monday through Friday from 7:00 a.m. – 7:50 a.m. and 3:30 p.m. - 6:00 p.m.
SCHOOL HOLIDAYS: Labor Day, Veteran’s Day, Thanksgiving Holiday, Christmas/New Year Holiday, Martin Luther King’s Day, President’s Day, Spring Break, Good Friday, Easter Monday, Memorial Day, all teacher planning and conference days, all unused weather days AND any Early Dismissal Day beforea school holiday. Reservations must be made prior to the date and will be accepted based on space availability. Extended Care will be closed on any early dismissal day before any school holiday including the last day of the school year. Extended Care is not available for grades 6-8 on early dismissal exam days. AM occasional - $8.00 per usage. Any CCA student K-12arriving before 7:45 a.m. will be sent to early morning care. The $8 fee will be charged regardless of arrival time. PM occasional - $8 per hour (or any part of an hour) per student. PM occasional care is based on space availability. Reservations must be made in advance. PM care is not available for grades 9-12. CCA closes promptly at 6:00 p.m. and all students are to be picked up before this time. 1st time:$10 for the first fifteen minutes and $15 for each additional 15-minute period. Student(s) may not return to extended care until payment is paid infull. 2nd time:$15 for the first fifteen minutes and $20 for each additional 15-minute period. Student(s) may not return to extended care until payment is paid infull. 3rd time: $20 for the first fifteen minutes and $25 for each additional 15-minute period. Student(s) may not return to extended day until payment is paid infull. *Student(s) will be dismissed from the Extended Care Program for excessive late pick-ups. Billing statements will be emailed to you on the first of each month. A $10 late fee will be charged to your account if payment is not received by the 10th of each month. If you prefer for your statement to be sent home with your student(s) let the extended care office know in advance. The registration fee of $45 is due at time of registration. First month’s payment is due by Monday, August 14. Monthly fees are due by the 10th of each month. Billing statements will be emailed on the first of each month. If a payment is not received by the tenth of the month a $10.00 late fee will be charged to your account. In addition to the late fee, your child may not return to Extended Care until your account ispaid infull. There will be a $25.00 fee for all returnedchecks. For the month of December, full time fees will cost half the normalfee. Fees are charged for full-time registered children whether the children are in attendance eachday. A late pick-up will result in an additionalfee. All fees must be paid in full at the end of the school year to receive final schoolrecords. Enter 2nd entrance from Livingston Road. Drive around the field and follow the line of cars. You DO NOT have to park and walk your child in. Only when your car is at the “AM ENTRANCE” sign can you drop your child off and remain there until you see them enter the building. Please do not park and leave your car in the line. You may park in the parking lot if you plan to walk your child inside. Parents are to go directly to the Extended Care office to check their child out. The staff will be contacted and your child will meet you there. Parents must show proper identification when signing children out. If there is a change in your child’s normal pick-up person, please send a note to the Extended Care office or call 268-8667. This will help expedite the dismissal procedure. The sign out procedure will be the same as above. An afternoon snack will be provided on school days. If your child has any special dietary needs, please plan to send the special snack to the Extended Care office for your student. Extended Care students who attend half day extended care are required to bring a lunch and drink. Extended Care will provide an atmosphere of order that is essential to allowing a student to strive toward a Spirit- controlled, Christ-like life. We believe parents bear the primary responsibility for teaching their children right behavior and attitudes and we will depend heavily on parents to help if there is a behavior problem. Rules and regulations are imposed to encourage proper habits, enabling the student to become self-disciplined. These rules will be clearly and concisely presented to the student. 2. Respect the property of others and theschool. 3. Make choices that allow the safety of one’s self andothers. 4. Make responsible choices regardingbehavior. 5. Make choices that enable all students to have positive experiences eachday. We want your child to experience a positive, enjoyable time; therefore, failure to comply with expected behavior will result in dismissal from the program. In addition to these policies students and parents are expected to follow all policies established in the Student Handbook. The Extended Care staff will contact you if your child is sick. The Director of the Extended Care program has the discretion to notify parents to pick up their child if the child has a fever of 100 degrees or above, if a child has an open and draining sore, if any other contagious condition exists, or if the child has a serious injury. If your child requires any medication during the period they are in Extended Care, parents must bring it to the school office, complete a Parent Permission for the Administration of Prescribed Medication form and note on it the time child needs to take it during Extended Care. If the school office is not open, please take it to the Extended Care office and follow the above procedures. PLEASE mark all your child’s personal belongings with their name. Items left for more that one month will be donated to a charitable organization. CCA cannot be responsible for lost or broken items; therefore, personal toys, computer games, radios, jewelry or other valuables should be left at home. Cell phones and iPads will be permitted but activity will be monitored. Any misuse or inappropriate use will result in our staff removing the device from your student and turning it over to the Extended Care Director. Parent(s) will be notified. We will strive to keep you well informed about “special happenings”. Please be sure to take a moment to view our website regularly. Any CCA student arriving before 7:45 a.m. will be sent to early morning care. The $8 fee will be charged regardless of arrival time. 1st time: $10 for the first fifteen minutes and $15 for each additional 15-minute period Student(s) may not return to extended day until payment is paid infull. 2nd time: $15 for the first fifteen minutes and $20 for each additional 15-minute period. Student(s) may not return to extended day until payment is paid infull. Billing statements will be emailed the first of each month. A $10 late fee will be charged to your account if payment is not received by the 10th of each month.